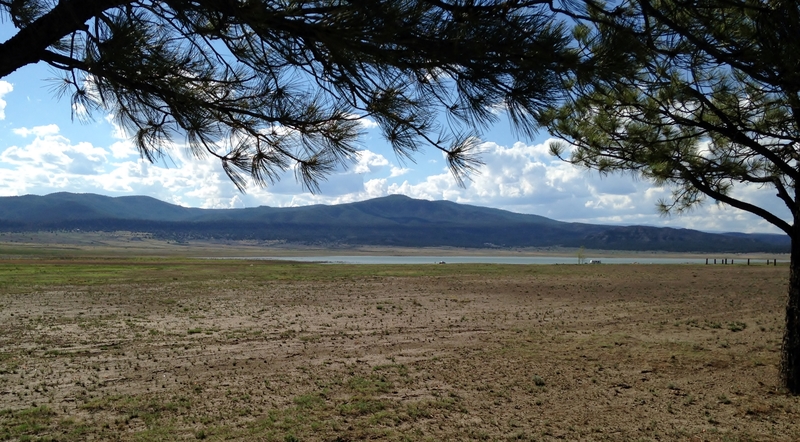 On 5/20 we had to leave Storrie Lake State Park, having used up our maximum 14 days in a 20 day period. Would have to find somewhere else to go. I wanted to get back to Storrie ASAP, since the weather was nice, the Verizon and TV signals were decent, good town/shopping and it’s just a pretty park. Villanueva was just 40 miles away down I-25 and I had never been there before. I had heard it was a pretty park, so we would do 6 days there and then be eligible to go back to Storrie Lake for 2 weeks. Most of the sites have these rock shelters. Made a nice area that I could close off with Riley’s exercise-pen and make a little private sitting area. It was a really pretty park. 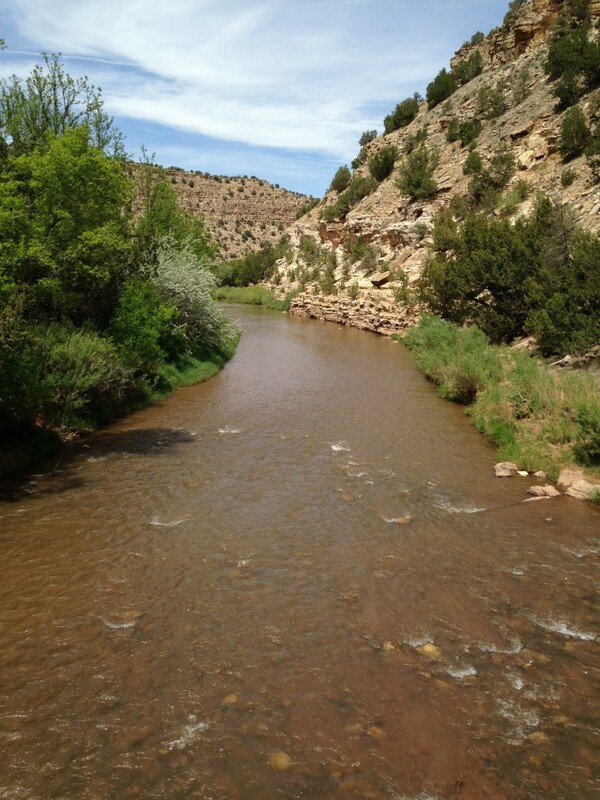 The Pecos River flows right through the park and has some good hiking. The visitor center is a nice looking building. Had some interesting displays in there. 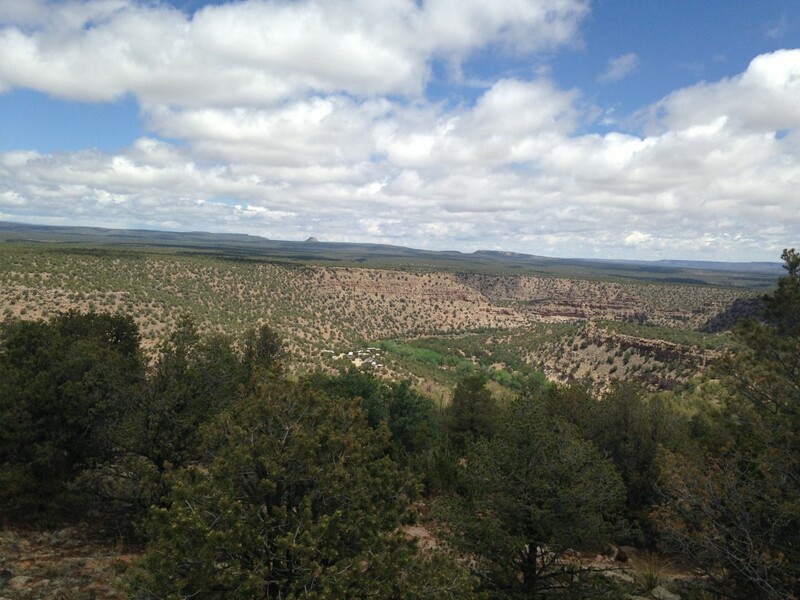 There are 3 trails in the park – the El Cerro Trail above the upper campground, the River Trail and the Viewpoint Loop Trail on the other side of the Pecos. 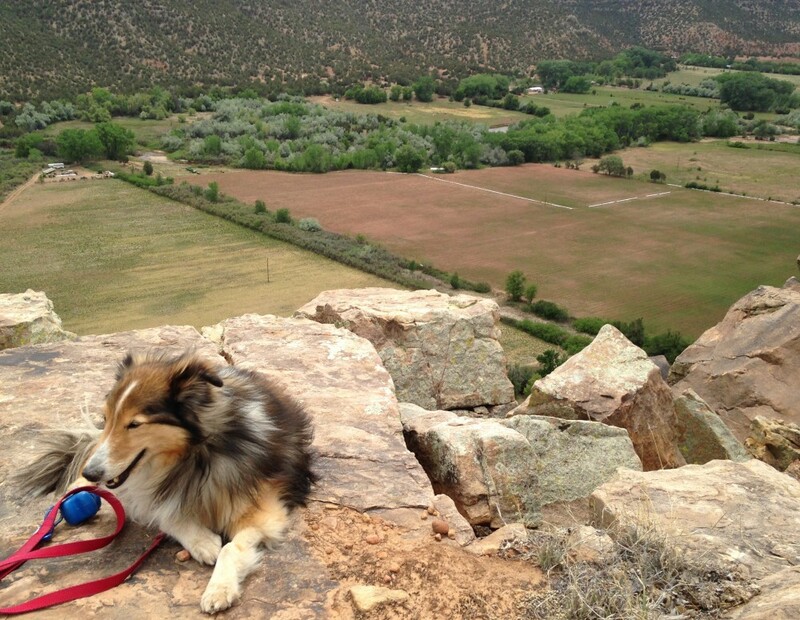 We did the El Cerro Trail first. It’s not hard and not long. 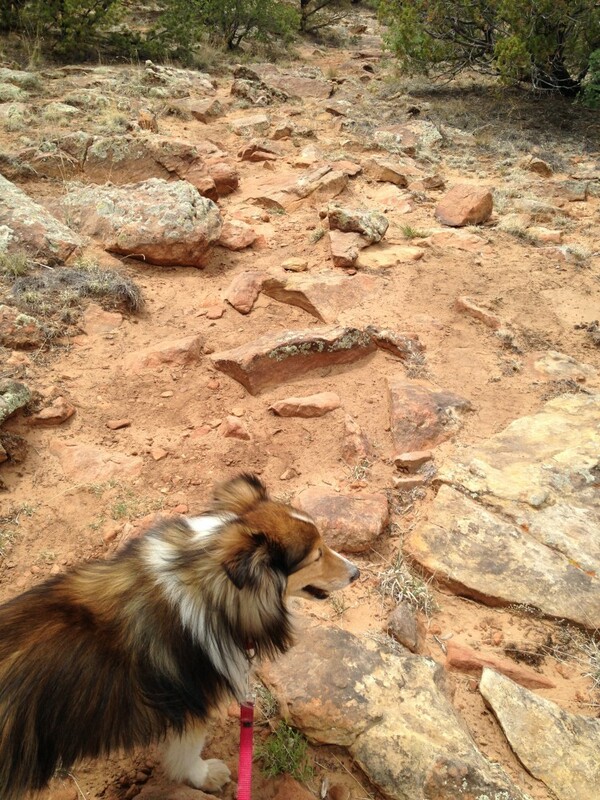 The trail is pretty rocky in some places. On another day we went across the bridge to the Viewpoint Loop trail. Sit….Stay… Awww, isn’t he cute? The trail is mostly rolling or level, with a couple of spots on each end where it’s like a rocky StairMaster and you get the elevation gain. The Verizon is good up there. I brought my Verizon MiFi hotspot and iPad and was able to get 3 bars of 4G. I could see the towers over by I-25 from up there. So, you just have to get high enough to line of sight. 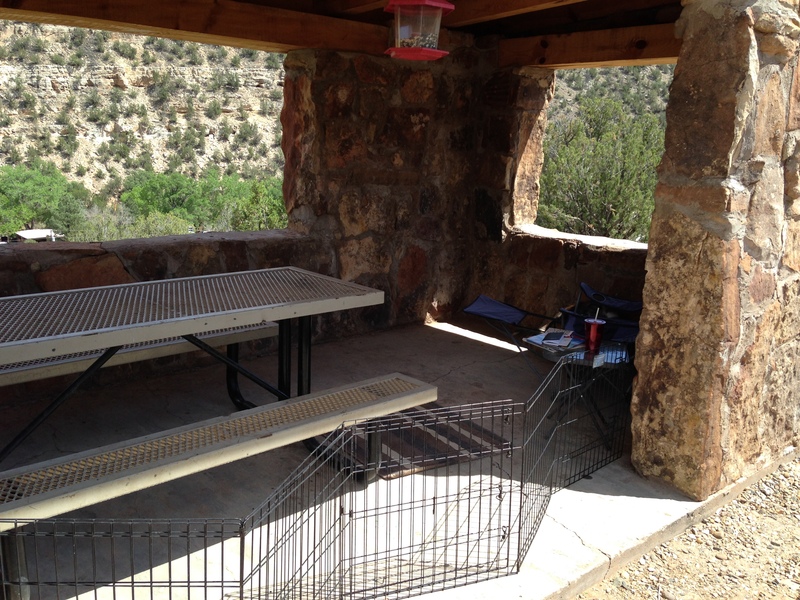 There are 3 shelters at the top of the Lookout trail and 2 of them have picnic tables. 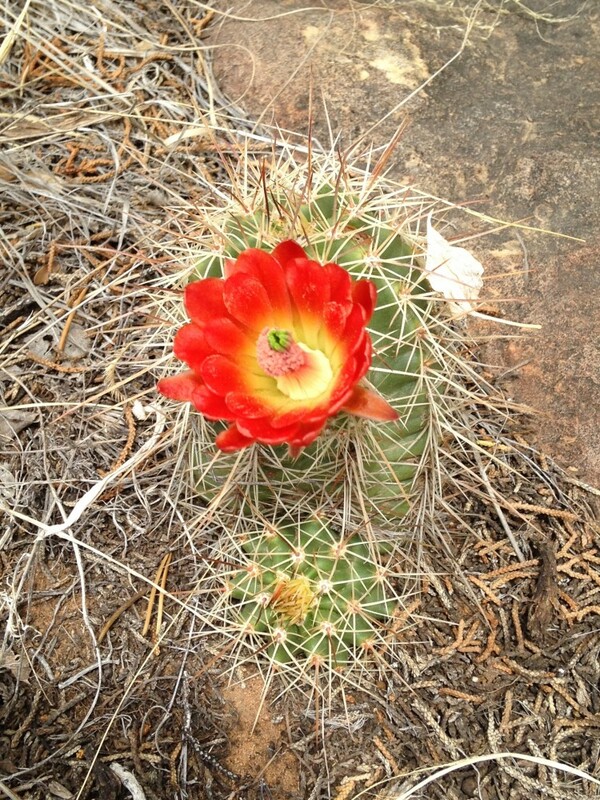 If I went back again, I would just hike the trail once a day and check in online. It’s less than 2 miles. Nice view of the park from up there, both the lower and upper campgrounds. Not having internet is good for getting other things done – lemon oiled all the wood in my RV, did some bookbinding, reorganized a couple of cabinets, rented movies at the Villanueva General Store, read, made dog treats, etc.. Lots of back-burner things finally get done when I’m bored. 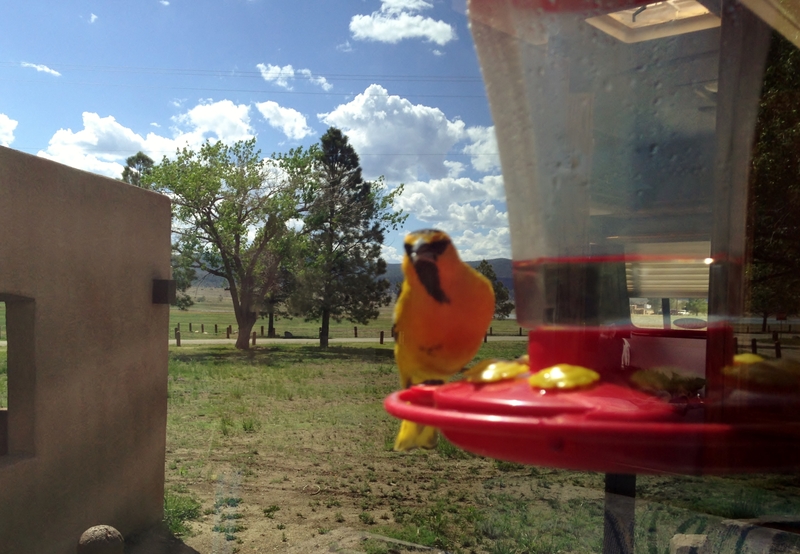 On May 6th we left Santa Rosa and headed to Las Vegas, NM. The route took us a little way on I-40 to pick up Hwy 84, then a few miles on I-25 to reach Las Vegas. As we drove up 84, gaining elevation as we approached I-25, I remembered the first time I drove that stretch of road. 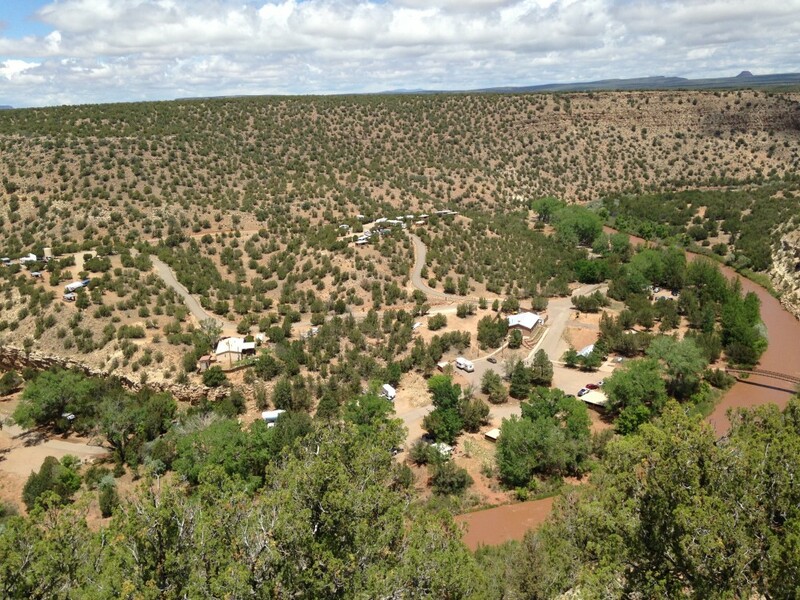 It was July 2011 and my sister-in-law Bev and I were driving to a casita we had rented for a week in Arroyo Seco, near Taos. Texas was HOT and we both needed some cools and some time away. In that stretch of highway you leave the desert-y scrub of southern New Mexico and get into more pine-y type vegetation. Santa Rosa is at 4,800 ft. elevation and Las Vegas is at 6,500, so it’s a decent gain. I had such a happy feeling (like back in 2011) that we were on our way to a cool and pretty place for a while. When we arrived at Storrie Lake I was right. The mountains across the lake are pretty, the field between the campsite and the lake was a nice blue/green grass and the lake was a pretty blue. I felt like I was living in a watercolor painting. The Verizon connection is 4 bars of 4G here, so that’s a great improvement. And, there is a Walmart on the north end of town, just 3 miles away. The town itself has lots of history and plenty to see and do. First, we did some exploring of the park so Riley could check all the smells and I could see what’s what. 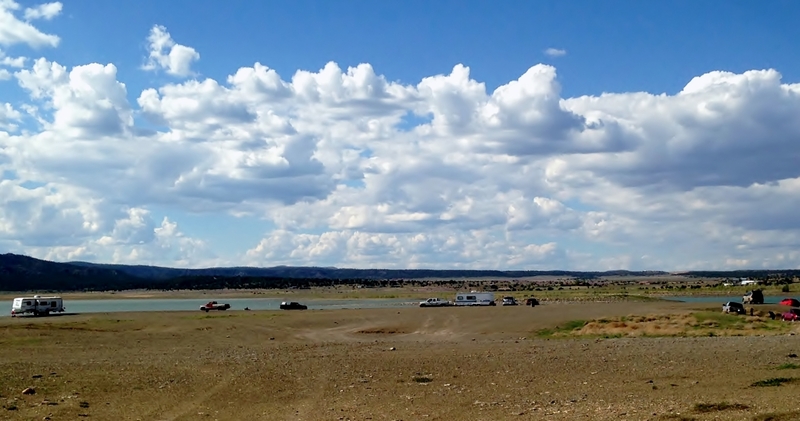 Storrie Lake was our first stop in New Mexico when we first took off on our RV adventure back in August 2012. But, I didn’t explore the park much then, spending a lot of time just getting settled in the Lazy Daze. 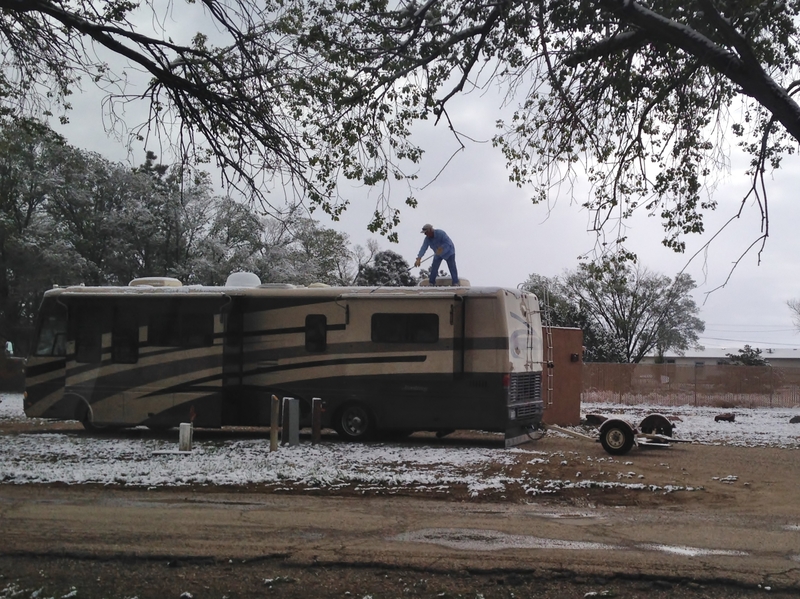 We were the only RV in the south loop when we arrived, and there were only 2 other rigs in the entire park. 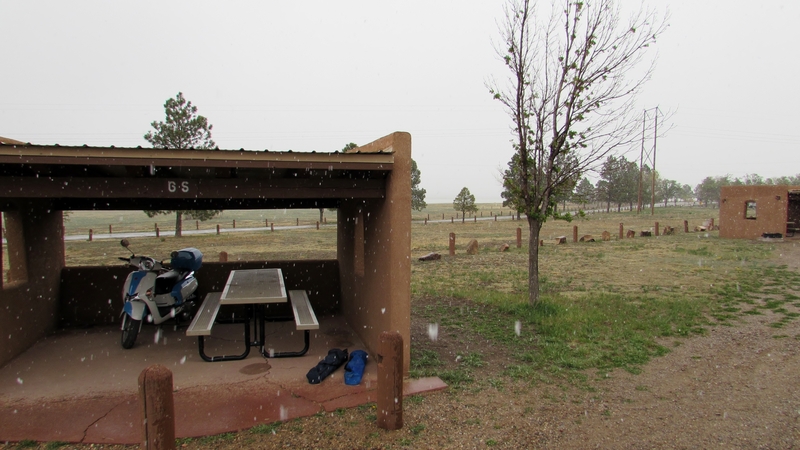 The office didn’t open until May 15th, the Riverside camping area was closed off and the restrooms were closed. Oh. Guess we were a bit early. Not to worry, though. We were fine in our self-contained home. Within a couple of days other RV’s started arriving and filling in. 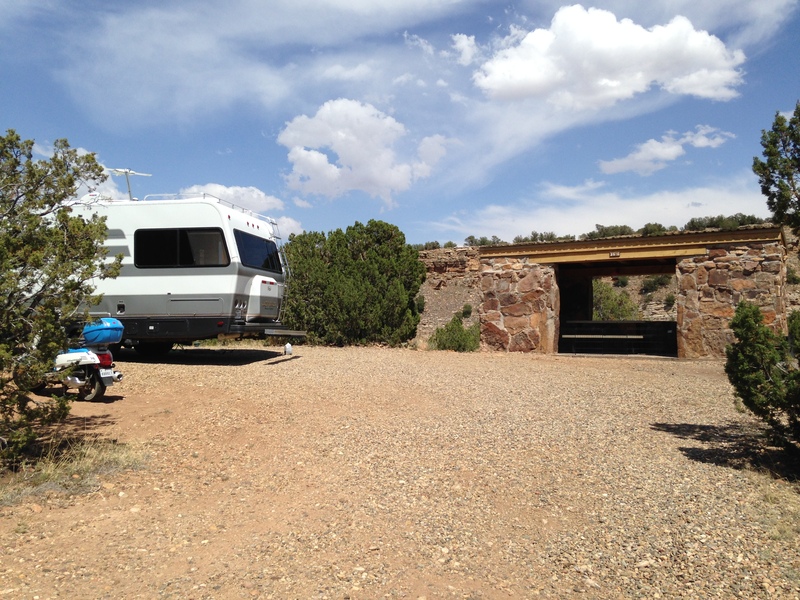 We were able to explore down by the Riverside campground, even though the road was closed to traffic. The road leads to an old wooden bridge across the Galinas River that flows into the lake. It’s closed off and is a termite buffet now. 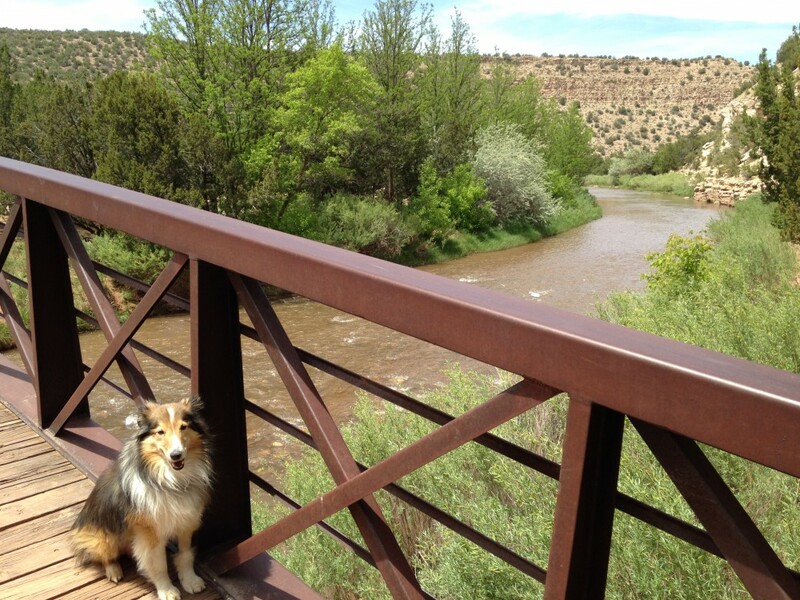 But, the “river” is just barely a trickle at that location, so we are able to walk across it and explore beyond it. Once, I brought Riley’s ball and and let him play over there. 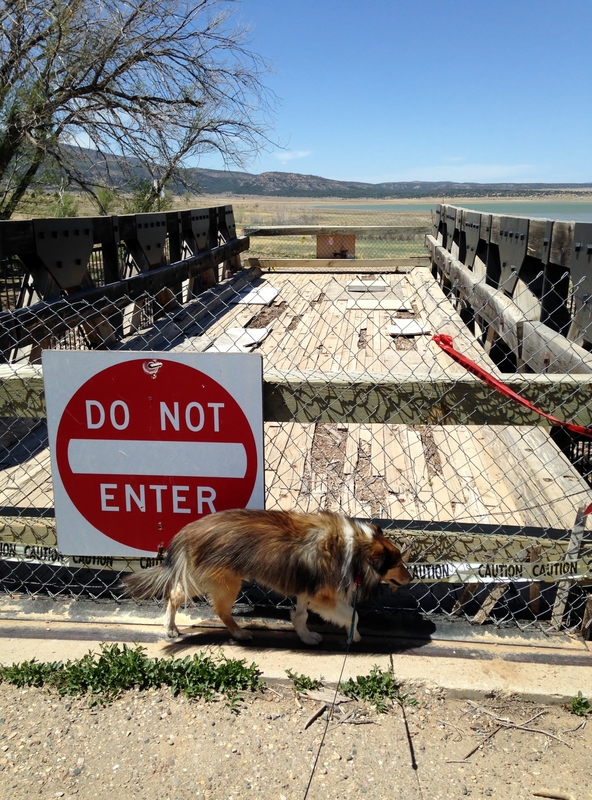 There isn’t really an off-leash dog area in the park and there’s no one across the bridge, so he wasn’t bothering anyone over there. It was a bit chilly when we arrived at the park, but got pretty cold by the 12th. I ended up backing up about 25 yards to the next site, which had electric hookups. I wanted to run the space heater, so took that site for 2 nights. It started snowing in the afternoon, so I popped outside and grabbed a picture. You can see some snowflakes starting to fall. The scooter is cozy in the shelter. I watched a movie in the evening and was surprised when we went outside at about 10PM for Riley’s last potty break. There was a blanket of about 2″ of snow on everything! 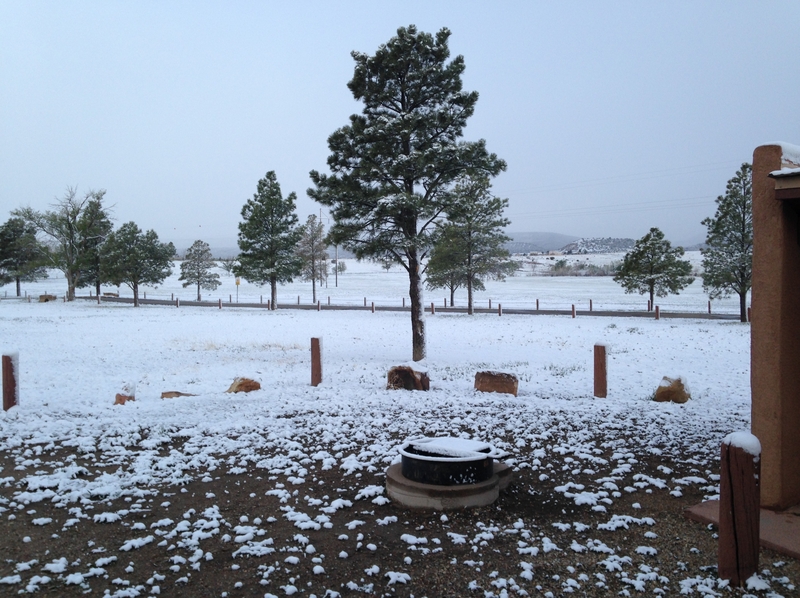 In the morning it had melted on the bare ground, but was still there a bit in the grassy areas. The guy across from me had to remove the snow from his slides before they could turtle-up and head out. Slides are good until you get a snowstorm. Anyway, the next day was still cold, but I still had my heater going, so we were cozy. Then I saw a brown Lazy Daze drive in. I racked my brain for who I knew with that color RV, towing a jeep. Turns out it was Jan, a fantastic photographer, and friend of Andy Baird. I remember reading Andy’s blog posts about all the cool sites he and Jan visited on their photography trip in Colorado. It was great to meet Jan and we had a chance to visit a few times while she was here for 2 days on her way to CO. I hope we can cross paths again on our travels. So, back to Storrie Lake info. 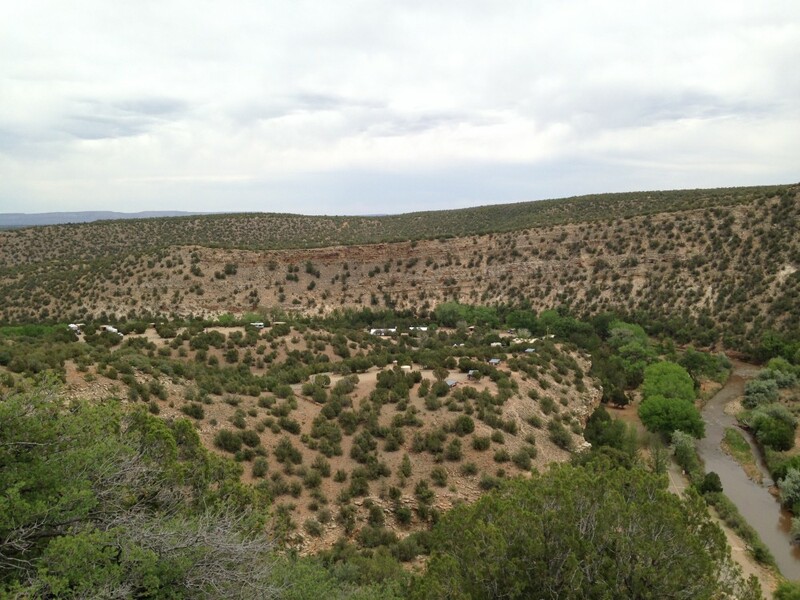 The campground has several camping areas. There are 17 sites in the south loop where I am, both electric/water and water-only, and reservation sites and non-reservation. There are another 30 or so electric or water-only sites between the north end of the park and at the Riverside campground. So, there are plenty of sites, most with the adobe shelter buildings. Then there is primitive camping closer to the lake. There is a big field there, plenty of room if the park is full. There is also a peninsula where a lot of the fishermen park their autos or RV’s. The fishing must be good at this lake. There are ALWAYS people fishing down there. 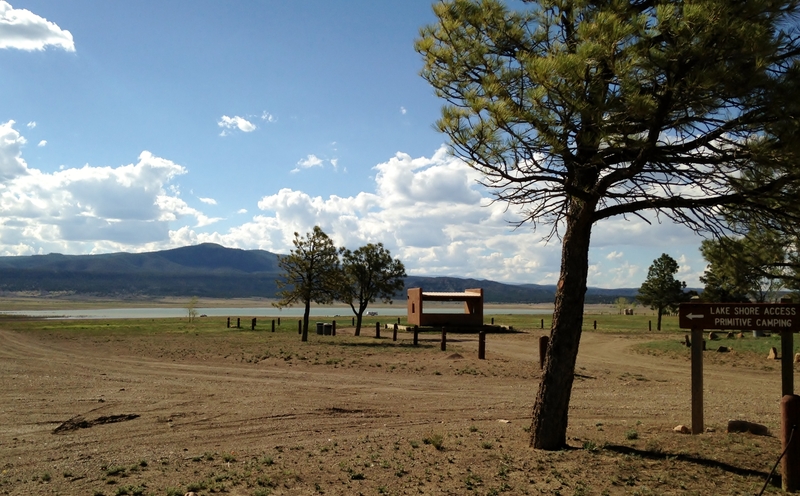 New Mexico state parks allow 14 days maximum at a park, then you have to be out for 6 days. (Basically 14 days in a 20 day calendar period – you can split that any way you want.) 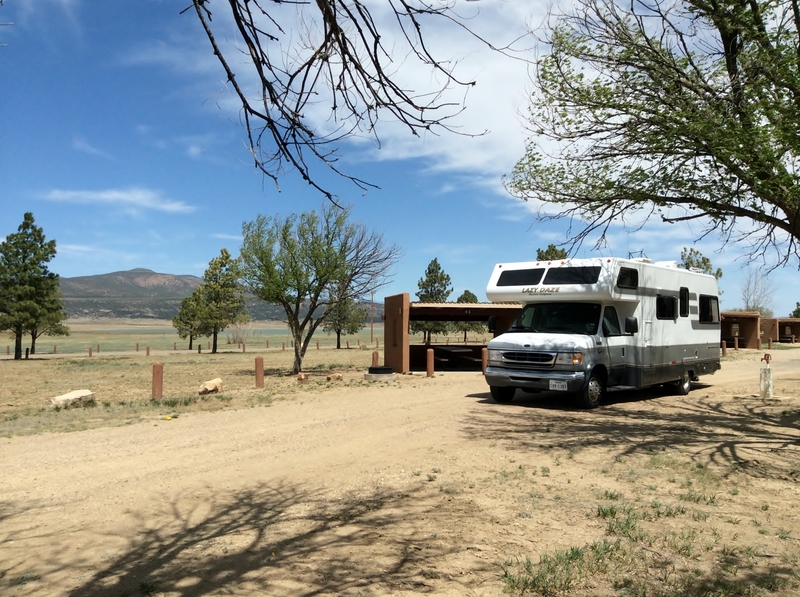 We spent the full 14 days at Storrie then went away to Villanueva State Park, about 40 miles away. We hadn’t been to that park before, but had heard good things, so wanted to check it out. Will post about Villanueva separately. 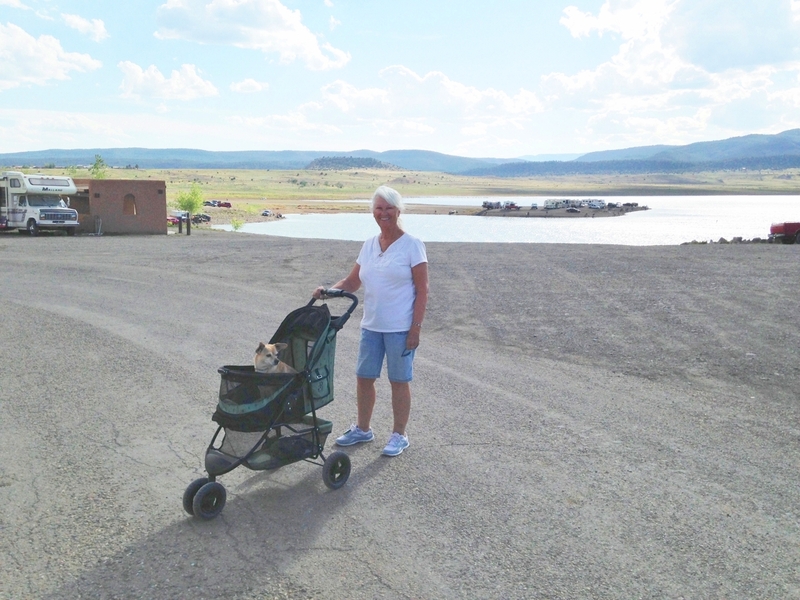 We got back to Storrie Lake on Memorial Day and I noticed an RV across from the visitor center as we drove in that looked like Me and My Dog’s Barbara. I knew she was recently in Albuquerque, but thought she would be going to Bluewater Lake. She likes to summer there and we had met her and Katie there in October 2012. So, I was surprised and happy when Barbara and Katie came by to say hi a couple of hours later. We had a great visit and got caught up. We have been walking dogs each morning and afternoon and enjoying visiting. Katie has an ankle that swells up when she walks too far. so when she is unable to go further Barbara has the stroller ready. It works out great. 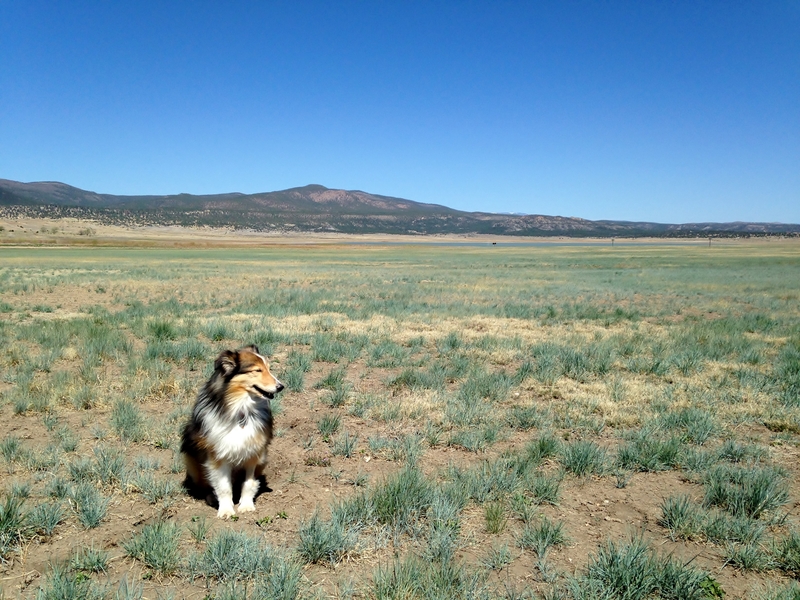 Also, on Memorial Day fellow Lazy Daze owner Nancy stopped for the night on the way from Santa Fe to Colorado. 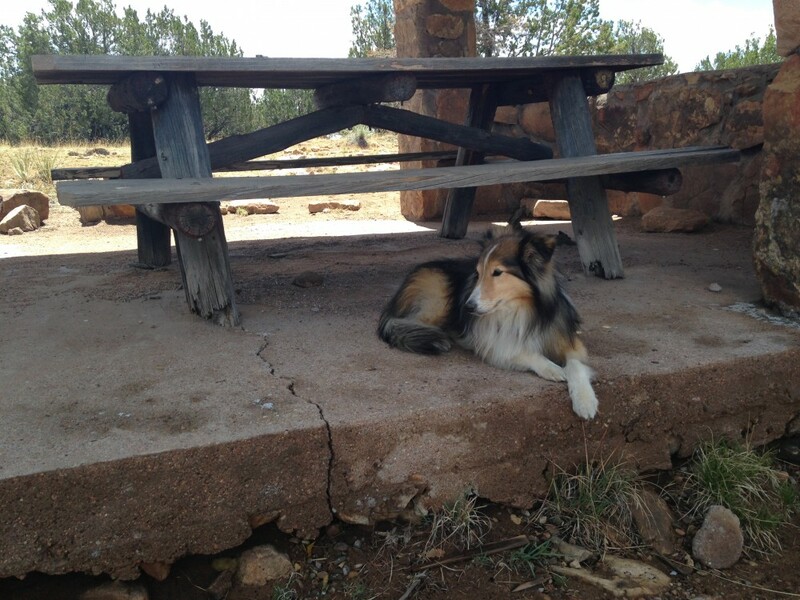 We met her at the Lazy Daze campsite at Quartzsite last year. It was nice to visit with Nancy again, too. More soon from Las Vegas. 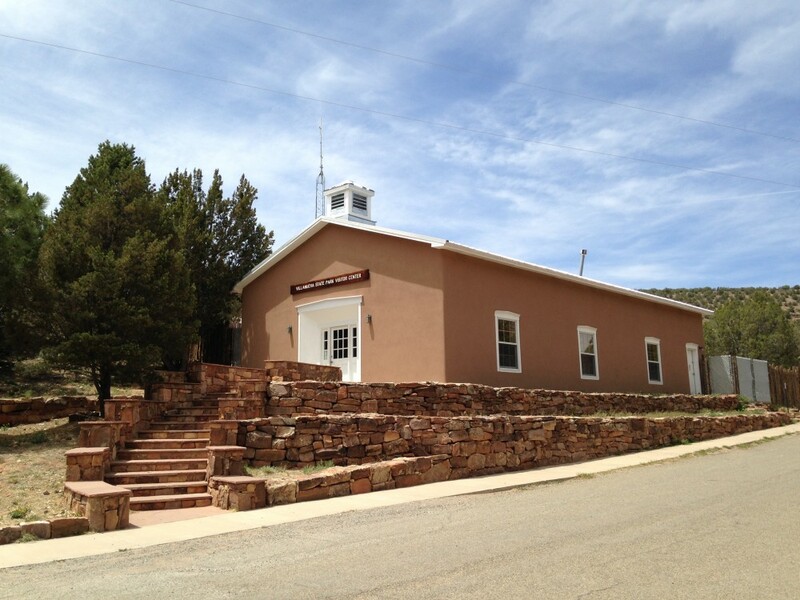 I have pictures of the historic downtown and up in the mountains.